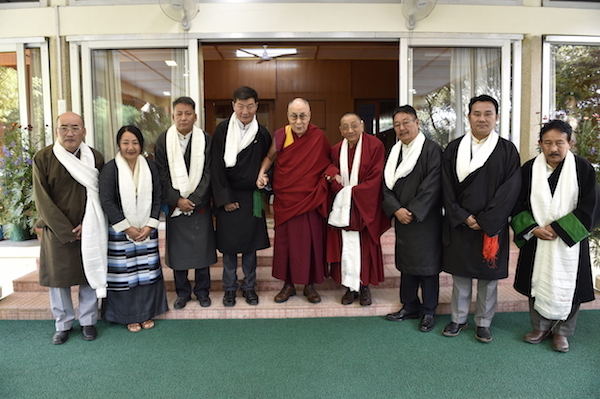 (TibetanReview.net, Jun03, 2018) – The 15th Kashag (Cabinet) of the Central Tibetan Administration (CTA) at Dharamshala, India, headed by Sikyong Lobsang Sangay, has marked the completion of its second year in office on Jun 1 by holding a prayer service at the Tsuglagkhang. The prayer service expressed solidarity with the Tibetan self-immolators and jailed Tibetan language rights advocate Tashi Wangchuk, said the CTA on its Tibet.net website Jun 1. “Tashi Wangchuk was advocating the language rights of the Tibetan people as per the provisions in the Chinese constitution and therefore his case highlights the lack of basic, fundamental rights for Tibetan people in Tibet,” President Lobsang Sangay was quoted as saying in his address to the prayer gathering. Tashi Wangchuk, a 33-year-old Tibetan shopkeeper in Yushu Prefecture of Qinghai Province, was detained on Jan 27, 2016, two months after he was featured in a New York Times video documentary and article, strongly criticizing the local authorities’ violations of China’s constitution and law by denying the Tibetan people their right to learn and use their mother tongue. He was tried on Jan 4 and jailed for five years on May 22 for “inciting separatism”. On the completion of his second year in office, Sangay has said it had occurred successfully “with significant undertakings and projects”. He has added that a detailed report will be released shortly.